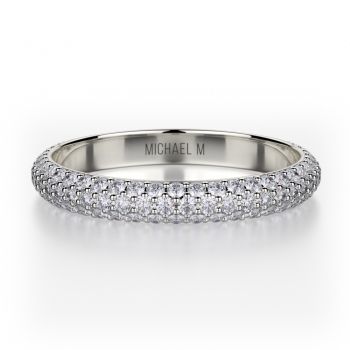 Every Michael M designer wedding band is genuinely crafted to match your own unique style. Discover the collection of sophisticated pave, channel, prong, and diamond wedding bands that you’ll cherish forever. 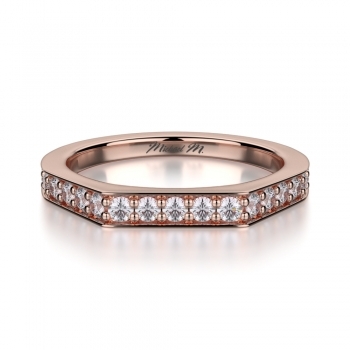 Carefully crafted to match every bride’s unique personality and individual sense of style, the women’s wedding bands of Michael M make the perfect complement to any dream wedding day. Handmade in their legendary Los Angeles design studio, Michael M’s women’s wedding bands are renowned for being vintage and modern-inspired pieces of bridal jewelry artistry. In addition to this variety, the women’s bands of Michael M are covered in a brilliant selection of handpicked diamonds, which are placed in a stunning variety of eternity and half-eternity, pave, prong, and channel stone settings. Further, the classically-trained jewelry making artisans of Michael M are committed to creating bridal jewelry pieces of long-lasting beauty. 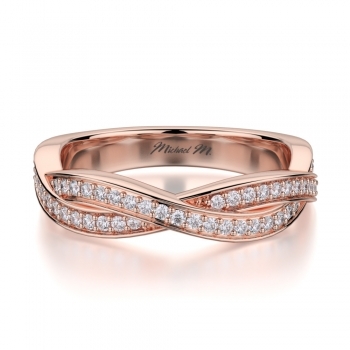 As a part of this commitment, Michael M’s bands are crafted with gleaming 18-karat white gold, yellow gold, rose gold, and 950 platinum, and can be found today at authorized retailers of Michael M.
Chic and sophisticated, the women’s wedding bands of Michael M are perfect for each and every bride-to-be. At every Michael M retailer are subtle and demure pieces, such as the Amore R709B, Crown R706B, Europa R688B, and Europa R396B bands, that feature multiple rows of brilliant eternity diamonds. 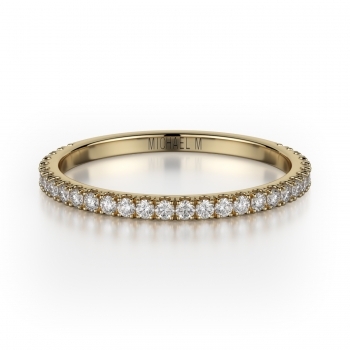 Also available, for brides searching for something more extraordinary, Michael M offers an array of women’s wedding bands including the Europa R693B, Europa R483B, Amore R461-B1, Estrella R306B, and more. Further, for those brides interested searching for a wedding band of a fashion-forward design, from Michael M comes models featuring one-of-a-kind band shapes, like the Amore R697B, Vercelli R656B, Amore R575B, and Princesse R401SB bands that are at the cutting-edge of bridal style. Inspired by contemporary trends and yesterday’s timeless designs, the engagement rings, wedding bands, earrings, bracelets, fashion rings, and diamond pendant necklaces of Michael M are the epitome of fine jewelry excellence. 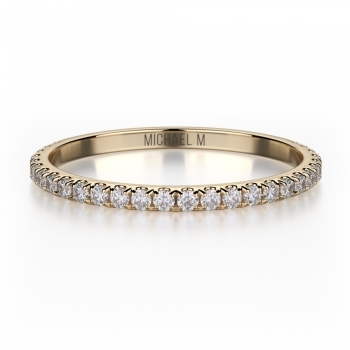 Family-owned and handcrafted in Los Angeles, Michael M’s unique pieces are created through hours-upon-hours of close attention, and are made to bring an eternity of satisfaction to the life of any wearer. For more information on Michael M’s women’s wedding bands, or to learn to explore the wide array of fine fashion jewelry available today from Michael M, please browse MichaelMCollection.com, or visit the “Store Locator” page to find the authorized Michael M retailer nearest you.